The latest alerts are here. If you have information about any crime, phone the police on 101 or 999 if you see a crime in progress or you can call anonymously to the independent charity CRIMESTOPPERS 0800 555 111. Several people in the village have been receiving scam calls supposedly from BT or OpenReach saying there is a problem with their Router. They are asking you to switch on your computer and presumably do something which would not be advisable. If you get any of these calls I suggest you contact BT on another phone for confirmation. The concrete balls on top of the gate piers at Pen Mill Farm have been stolen, probably on New Year’s Eve. They were painted a gold colour so maybe the thieves thought they were getting more than they got. It looks like they also left a torch behind, though police don’t apparently have the resources to test for fingerprints. If anyone sees a couple of golden balls while walking their dog etc., please contact Peter or Sarah. Overnight 8-9 November a property at Yarlington was entered via a roof and an amount of electric cabling stolen from inside. Overnight 8-9 November a container at a property in Bratton Seymour was broken into and a quantity of tools stolen. overnight 8-9 November attempt was made to steal a mini digger from a property at Castle Cary. During the afternoon/evening of 10 November work tools were stolen from a van parked at Stoke Lane, Bayford. Yesterday - there was a white BMW estate driven fast by 2 men cruising around Penselwood. They came down the drive of Forest Lodge and despite the electric gate they approached the house and then backed out fast. They were seen doing a speedy U turn under the A303 and heading back in this direction. When approached they declined to stop and the 'chassis language' was aggressive! Look out! I’ve just been advised by Clive Kirby of another handbag theft from a car parked on the Ridge near Pen Ridge House. This occurred at around 10AM this morning so close to the time of the previously mentioned one. Obviously someone is in the area so please do not leave anything on show in your cars. A car parked outside the field where the parking takes place for the Fete was broken into this morning, (Aug 20th). Belinda, Franey & Gillian Matthews’ daughter left an old handbag on the passenger seat. 10 minutes after she parked, she heard her car alarm trigger and came back to find the near side passenger window had been smashed and her bag snatched. Fortunately it had nothing of value in it so she’s hoping it will be dumped nearby. Belinda had noticed a man standing looking over the gate of the Community Field as she arrived and thought he looked a little odd at the time. She thinks his vehicle was pale blue or grey. Please keep all eyes open. During the evening of 14 August a burglary occurred at a property in Chapel Lane, Pen Selwood. Access was gained through an insecure door and items stolen including a bag containing bank cards, cash and a car key. Police are appealing to residents of East Somerset to help us find a horse carriage stolen from a farm in Rudge. The two-wheel carriage was taken between Saturday 7 and Sunday 8 April and the owner is really keen to get it back. 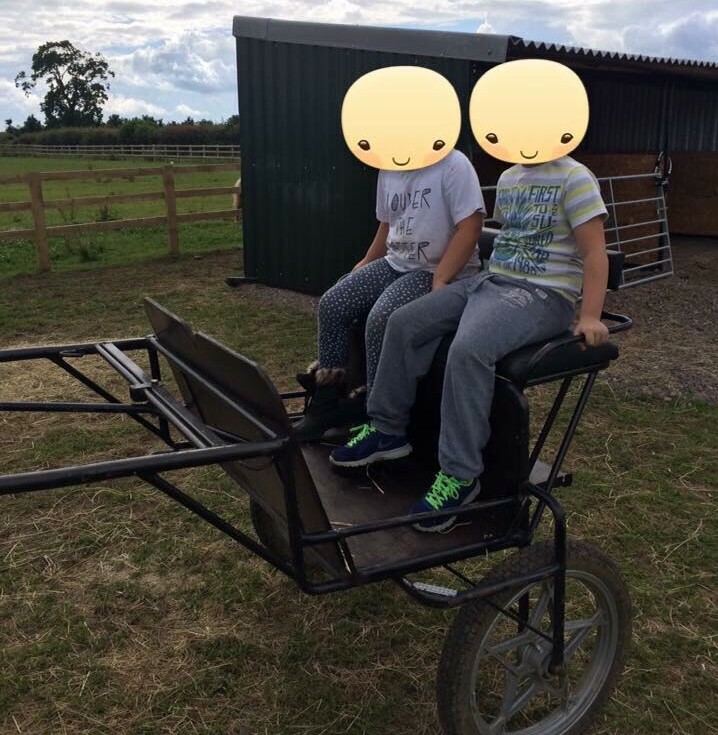 The carriage has very distinct wheels with stars on the frame and we’d like anyone who may have seen it to text information to 07492888109 or call 101 quoting reference 5218074424. If you'd like to remain anonymous you can also contact Crimestoppers on 0800 555 111. We spoke to Sue Phillips, who lives in one of the cottages at Pen Mill Farm this morning. Last night about 9.45pm they heard noises in the yard outside their door. By the time her partner had got his shoes on and gone to investigate the intruders had run off. They had rummaged in their pick-up, not locked, but had not taken anything. Sue mentioned that two men had approached her a few days earlier asking if she wanted to sell her red pick-up, they were in a white pick-up. It may not be related but maybe of interest. Victims had cold callers at the door and were persuaded that work needed to be done on the roof of the property. The victim went to the bank to withdraw a significant amount of cash to pay the callers in advance. However the bank staff thought it suspicious and reported the matter to the police. Yesterday in Wells a resident received a telephone call from someone claiming to be from the Bank advising that their account had been compromised and advising to transfer the savings into a safe account. Victim did this and has lost £45,000. Police urge extreme care with regard to any cold callers at the door, telephone callers and Emails from unknown sources. Do not have dealings with cold callers at the door. Do not give out personal information to anyone - please remember that official bodies such as banks will never telephone you at home and ask for your details. If you are in any doubt call the police on 101 - and if you feel threatened or intimidated particularly by callers at the door then call the police using the 999 system. During the early hours of 7 January a shed at a property in South Barrow, Yeovil was broken into. Victim disturbed the intruder who made off. Nothing thought to have been stolen. On 7 January theft of goods from a store in Castle Cary. A parcel delivered in Bridgwater and left in the porch at the front of the delivery address. Victim returned home to find the parcel missing. Officers ask you to take care over the security of parcels being delivered. If you are not going to be home to receive them, try to find an alternative where they will be home. If you are buying on-line then many companies use a `click and collect' service with other more local businesses which can be convenient. Over recent weeks there has been a large increase in vehicle crime. Variety of vehicles targeted but in some areas theft from vans has been particularly high. The majority of these are privately owned or contract vans (as opposed to the corporate image vans). Unknown offender(s) have been breaking into the vehicles, mainly by smashing a window and stealing power tools. We have also seen an increase in theft from cars. Items such as satellite navigation accessories and handbags have been targeted because they have been left on display inside the car. 4. Remove the sat nav holder from the windscreen and wipe away the sucker smudge from the windscreen. As always, please ensure you report all suspicious activity to 101, or 999 if crime is in progress. We require three Independent people to contribute to the development and effective discharge of the Independent Residents Volunteer Panel. Independent Persons sitting on the Independent Residents Panel are an important means of enhancing public trust and confidence in the review of complaint files against Avon & Somerset Police and the governance by the Police and Crime Commissioner. The role profile, person specification, candidate timetable, application form and supporting literature can be found on the PCC website (www.avonandsomerset-pcc.gov.uk) in the Take Part section. The closing date for applications is 16 January 2015. Please note: serving police officers, PCSOs, staff or volunteers of the Constabulary would not be eligible for this role. This is a general message to schemes across Somerset. There has been a general increase in the number of thefts from motor vehicles recently. Some of these are occurring in shopper car parks, some in residential areas and an increasing number in rural car parks. These rural car parks are often in beauty spot areas and predominantly used by walkers during daylight hours. Vehicles have generally been left secure and access has been gained by breaking windows. Items left on display in such vehicles has been targeted - such as personal items, satellite navigation accessories and small change left in central consoles. Please remind members of this type of crime and ask that they not only keep vehicles secure, but remove temptation by ensuring they do not leave any items on display. No matter how inconsequential you think the item is, it could be too good an opportunity for the would-be criminal. Between 7-14 November a break occurred at a property in Broadway Road, Charlton Adam. Entry was gained into the garage and a chain saw stolen. Overnight of 15-16 November a burglary occurred at a property in Cole Mead, Bruton. Access was gained by forcing open a window. A search was made inside the property and items stolen include 3 laptops, jewellery, digital camera, credit cards and driving licence. We are reminding people to be careful of phone scammers after several reports of bogus callers claiming to be police or security companies. There have several incidents in North Somerset and South Gloucestershire over the last month where residents received a call on their landline from someone purporting to be from either the police or a security company. An elderly couple in Clevedon, North Somerset, received a call from a man claiming to be from "The Crime Reduction Unit of the police". He was trying to persuade the couple to buy an alarm for £1.00 that would connect them to the local police and fire service. He also wanted to make an appointment to visit their home. They weren't sure about the man so they hung up and told their neighbour, who alerted police. In a similar vein, an elderly lady in South Gloucestershire was made aware of a potential scam after a friend received a call. When she then got a phone call herself she was prepared. She was called by a man who stated he was from a security company wanting to conduct a home survey. She asked for the proposal to be put in writing and for a letter to be sent with some literature to her so she could speak to her son, at which point the man put the phone down. PC Fin Simmons from Avon and Somerset Police said: "I encourage people to take care when they received unsolicited calls from people. The two ladies who received calls did exactly the right thing in trying to get the person to prove their identity. Reputable companies or genuine callers will be happy to prove who they are and provide identification. "It's important to reiterate the more we talk about these scams, the more people are made aware of them the less likely they are to become victims. Please spread the word to your relatives, neighbours, colleagues and friends, especially those who are elderly or vulnerable. "If you are unsure of anyone asking you for details, we would advise you to be overly cautious. There are some simple but effective measures people can take to minimise the risk of becoming a victim of these scams."
. If someone claims to be from a company check their details, look at their website and see if they have any testimonials.
. Call the company, but don't use a number the caller gives you. Look one up on the internet or in a phone directory. Before you make the call, either use a different telephone or wait for a dialling tone to ensure the bogus callers are not still on the line.
. If the person claims to be from the local police, always ask for their collar number or staff I.D number. Every officer or staff member has one. You can then call 101 to check they are who they say they are.
. Don't release any personal information including any bank details that could be exploited unless you have confirmed the caller is genuine and reputable and you actually need what is being offered.
. The police and the banks will never ask you for banking details or PIN numbers on the phone. Thank you to the many among you who have completed Police and Crime Commissioner Sue Mountstevens' 'Active Citizens Survey'! There are two days left to take part, so, if you haven't already, please consider giving up a few minutes of your time to help us shape the constabulary's service! Below, I attach the PCC's original email. In March 2013 I issued Avon and Somerset's first Police and Crime Plan which set out my commitment to reducing the impact of anti-social behavior and preventing and reducing burglary, particularly by working with local residents and communities. Local 'Watch' schemes, such as Neighbourhood Watch and Community Speedwatch play an important role in contributing to this plan and, I am therefore very keen to hear your views about the scheme that you are involved in and the support you receive from the police. I would therefore be grateful if you could take time to complete this survey, which should take no longer than 10 minutes. - telephone Sergeant Paul White on 01275 816547. He will be able to send paper copies of the survey. The survey is confidential and will be used to inform the way that we work with schemes such as yours and empower communities to tackle the issues that most affect their area. I would like to thank you in advance for your support and involvement in your community. Your contribution is important to both myself and the Constabulary and you have my continued support. Sue Mountstevens your Police and Crime Commissioner will be holding her next public forum on Wednesday, September 10th from 1845 - 2100 at Fyfe Hall at the Trinity Community Centre, Trinity Road, Bristol, BS2 0NW. It's a chance for you to hear from Bristol's District Commander Chief Superintendent Jon Reilly, and to ask any questions to the PCC, Bristol's Commander and other senior police officers. If you would like to attend please register in advance by visiting www.eventbrite.co.uk/e/pcc-public-forum-tickets-12287242473?aff=es2... or calling 01275 816377 so we can ensure a seat is reserved for you. If you have questions please email them ahead of the event to pcc@avonandsomerset.police.uk . This will enable the PCC and senior police officers to bring the relevant information to the meeting and give those who cannot attend an opportunity to have an input. This is a general message to all schemes which you are welcome to pass to your members if you feel appropriate. We still have a few teething problems that are currently being dealt with so there may be some small interruptions to the general service. We do apologise for this but hope to keep disruption to a minimum. In the meantime if you have any queries relating to your Watch Scheme, please do not hesitate to contact Lindsey at the new office.